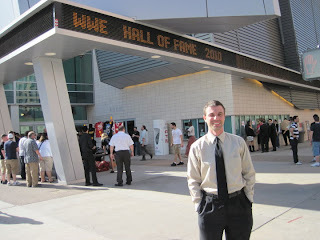 Me at the 2010 WWE Hall of Fame ceremony. Welcome to my new blog. I've been a wrestling fan for more than 25 years. I also enjoy writing, so naturally in this new era of social networking, it only makes sense for me to blog. Right? My love for wrestling started at around age 11. I remember when I was much younger my dad, brother, and uncle would go to the Kiel Auditorium when the NWA would come to town. Shows featured "King Kong" Brody, Harley Race, Ted DiBiase, and of course world champion Ric Flair. At that time, I had no interest in wrestling. I can't pinpoint the moment that my love for it happened, but I do remember it was around the time Hulkamania started running wild in January 1984. This was the WWF, a much different promotion from the old NWA. Die hard fans know what I'm talking about. To me, the WWF was like a live action cartoon with larger than life characters like Hulk Hogan, "Rowdy" Roddy Piper, The Junkyard Dog, and Andre the Giant. My first house show came in December 1984. The headline match was Hulk Hogan vs. Brutus Beefcake. This was years before he had become "the Barber." A large group of us attended the show at the old Arena in St. Louis. We had floor seats, and ran to the other side of the building to get a closer look at the wrestlers as they entered and left the ring. Seeing "Superfly" Snuka and the Hulkster up close seemed like such a dream come true. At age 11, I felt like I had lived a complete life. As the years went on, my fondness for wrestling grew. Fast forward to my early 30's and my first trip to a Wrestlemania. For those who don't know, Wrestlemania is the Superbowl of wrestling. As I continue to blog I'll talk more about my experiences with wrestling and post highlights from the four Wrestlemania events I've attended since 2006. So welcome, enjoy, and please share your thoughts with me. I remember those house shows very well. I actually still have the ticket stubs for a few of them in a scrapbook. Remember Bulldog Bob Brown doing the run in on Flair when he got himself DQ'ed against Kerry Von Erich or Hogan vs Bundy in the big blue cage? How about the time we found half of a dead mouse under our seats at the old Kiel and kicked it down on the people below? Good times! Thanks for bringing back some of those memories. Wow, that's right. I forgot about that dead mouse. Those were the days. Good times for sure.